A buttery graham crumb crust, a triple-berry cream cheese filling and strawberry jelly are layered in this no-bake summer-fresh dessert. COMBINE prepared crumbs with butter. Press mixture onto bottom of a 9 x 13 inch baking dish. BEAT cream cheese and sugar with electric mixer until smooth. Stir in crushed fruit. Fold in whipped topping. Spread over crust. PREPARE jelly powder following the 30 minute set method as directed on package. 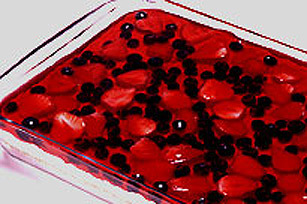 Stir in berries. POUR over filling and chill for 3 hours. Use a food processor to cut cookies into fine crumbs.